Our staff of legislative professionals analyze and summarize every bill as they are filed. 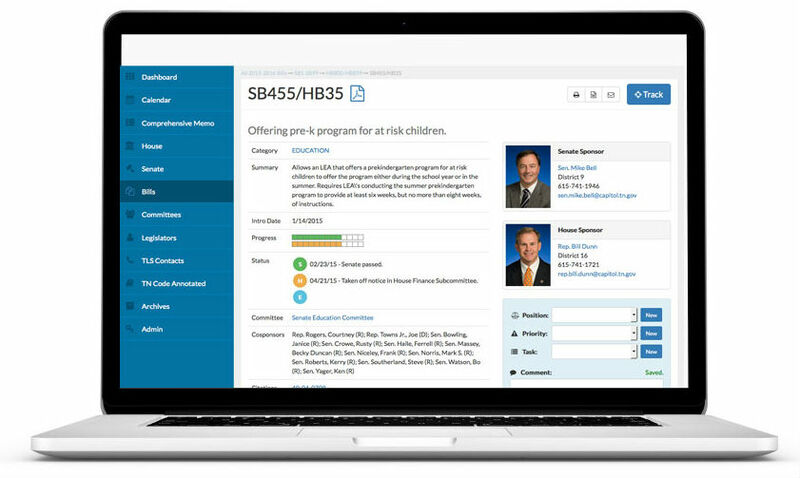 Our state-of-the-art search engine lets you research the exact legislation you care about. Every bill summarized. Quick lookup. Search like you would shop. We load actions on bills as they happen — and you are notified on every bill you are tracking in real-time. Receive daily recaps of actions on all legislation, new bills filed, and calendar updates.  Create Unlimited lists of bills. Receive action alerts and nightly updates. Need to plan out your day? Create and print a custom Calendar Report. Need to send your client an update on their bills? Create a custom Bill Report with only the information you need. Customized Bill and Calendar reports. Send them to clients with your logo. Narrow your search to exactly what you want. You enter any keywords, categories, TCA citations, or saved searches on day 1, and we do the rest. 6 Bills will be immediately suggested if they match any of your criteria! Watch the full demo "20 minutes to save you 20 hours"
Rank legislators for your organization — and share it if you want! When a bill is filed, we look it over and give it a new title, a category, and a full summary of the filed text. Don't rely on guesswork — let our experience and expertise help you do the research you need for your business. Create as many lists of bills as you need. Organize them however you want, and get email alerts on whichever tracks you need to. Have an important hearing coming up? Add it to your calendar with one click. See every bill on the agenda right there in Outlook or Gmail Calendar. Your whole team can share files, tracks, bill positions, priorities, and tasks. Keep tracks, searches, and reports private or share them with your organization. Every report is custom - only the data you need. Personalize it with your custom logo, and save dynamic reports that update every time your report is run. Track a bill, set your track to receive alerts, and you will get an email as any action happens to your bill. Narrow your search or query our legislative database in any way you can imagine. Find bills by dates, sponsors, categories, positions, tracking status, TCA Citation, and many more. See every legislator's biography, legislation, committee memberships, district maps, votes, and more. Includes contact information, personal history, and statistics on legislative movement. Wondering where in the laws each bill will change, and what that section means? Browse the full TN Code Annotated laws, by Title, Chapter, and Section. Each bill is linked to the laws it will affect. Follow every vote on a bill whether its in a committee or on the Floor. See how each legislator is voting and which bills are moving. Enter in the keywords, categories, and TCA Citations that matter to you. When new bill text comes in, you will be automatically notified if it matches your personal settings. Every piece of bill text on every bill. We match references to citations in the bill to a clickable TCA citation on file. If you need more detail than our summary, read the whole bill. When something is added to a bill, we post the full amendment text along with our own summary of how the amendment will affect the filed legislation. Stay informed on how bills are changing. See every bill on a committee hearing in the order they will be taken up, as well as location, which legislators are present, and any relevant notes. See full details about the bill. Make sure you are ready when your bills are taken up. Add our experience to your team! Our staff has been tracking legislation in Tennessee since 1987, and we have seen and heard it all. We are always available to answer your questions about the legislature or your account. What do you want to remember about this bill? Add an immediate comment, right there on the bill page or from anywhere you can see the bill. Comments are shared with your team and can be added to reports, removed, or updated at any time. Prepare for your day at the Capitol by printing out a fully customized committee agenda. See only the bills you track, or every bill, or details on your tracked bills. Choose only the committees you care about or the whole day. Want to keep your own files along with a particular bill? Have a detailed impact document or call to action you want to share with your team? Forget email — upload the files directly on the bill for your whole team to access! Can't remember how to get that Calendar report you want? We are available any time for questions and support with your account. Also be sure to join our trainings to get the most out of your TLS experience. Do you care how legislators vote? Keep track of every vote, add your own position, and compare it with every legislators' position on every vote at once with our Legislative Scorecard. Keep track of who voted with you, who didn't, and who you need to get in touch with before that next vote. We have a tailored twitter feed with every organization, legislator, office, business, and department you need to watch to stay on top of Tennessee legislation. We also link our legislators with their Twitter accounts — you can even tweet at them directly from TLS! Ok, so you care about this bill — now what? How about giving it the position Oppose, make it an Urgent priority, and assigning it the task of Speak with Committee Chair. TLS makes it easy to add any position, priority or task you want to any bill, all shared with your whole team. Every feature of TLS is built mobile-first, so you never have to wonder how you're going to access your legislation. TLS is a fully-featured, responsive, beautiful site with everything you need on any screen. Between our archives going back to 1987 and our full site, we have 30 years of full bill text, sponsors, citations, and actions on every bill. Need to know how other bills like this have done in previous sessions? Use our advanced search and research tools to see old committees, legislators who have retired, and bills from any session. Know your data and password are secure when you use Secure Socket Layer HTTPS. Every click on TLS is fully encrypted using the secure web standard. Look for the on your address bar, and "https" to ensure you are experiencing a secure site. What information do you need about the legislature to start your day? Our Daily Update has every new bill filed, every action on every bill, and any new committee hearings. It can be personalized to show you just bills you care about. We also notify you if there is any new bill text that matches your keywords, citations, or categories. Want to see at a glance where your bills are? Looking at a list and wondering which bills are moving? Can't tell which bills have already been assigned a public chapter? We make the complex movement through the legislature into a searchable, sortable, easy to understand graphic. Everything you need to research, understand, track, report on, and share legislation in Tennessee. © 2019 Tennessee Legislation Service. All Rights Reserved.